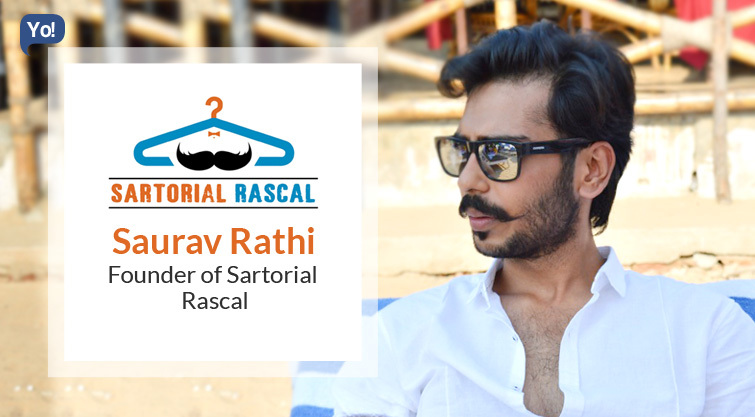 Saurav Rathi is one of those people who belives that if you offer a consumer oriented service or product then you are bound to capture the attention of consumers. Belonging from Kolkatta, he has always been fascinated by entreprneurship and startup culture. This was the reason why he himself jumped on the startup bandwagon and launched his own venture called Sartorial Rascal. It is a personalized styling hub for men. They send hand-picked apparels best suited for your style, budget & preference. He is passionate about fashion and this is the core reason why he ventured into this sector. We are an online men’s personal styling fashion portal. We send a box full of hand-picked clothes and accessories best suited to our customer’s style, budget and schedule preference along with a hand-written thank you note and style tips. I started honing my fashion knowledge during the 2nd year of college. Once people started noticing and acknowledging my improved style sense they often called me for style advice. As the numbers started increasing, I thought it will be awesome if I could build a business around this. Hence, the idea of making personal styling accessible for men across India was born. I am sold on Steve Job’s concept of Stay Hungry Stay Foolish! Always be hungry for more and take risks that others consider foolish. That being said, enjoy the climb but don’t take your eyes off the summit. People had a mindset that personal styling is a premium service which is offered by high end brands only. Conveying our message that personal styling can be provided to the masses at a negligible/no added cost was challenging. Over the last two years I was determined to do something in the men’s fashion arena. So once I saw the potential in this idea I decided to quit my job and take the plunge. This has its inherent risks but I am willing to take that leap of faith. We are a bootstrapped company and would be looking to raise fund as and when needed. Patience- Because good things take time. Perseverance- Achieving success is like running a marathon not a sprint. Confidence- Have faith in yourself and what you are doing. Mailchimp; Dropbox; InShorts; news apps and a whole lot of Google apps- Analytics; Keep; Adwords etc. They have made it seamless. Having a daily to-do list sorted in terms of priority and trying to finish the list on the same day. I have a very bad memory and often forget things. Hence the habit of a To-Do list. Consistency- This is what separates the acheivers from the rest. Over confidence- it not only drowns your ship but wrecks to the extent of no recovery. Spend more time executing than planning. People see what you do and not what you think. We intend to become a one stop shop for all the fashion needs of men. Along with that we would be working on strengthening our back end infrastructure. Instead of opting for CA, I would study fashion designing and hone my skills all the better. Though, it is not off the cards even now.